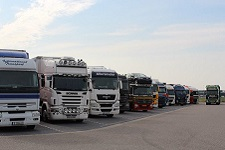 Truckstop 8 is a resting point for drivers, as well as being a business meeting point. And that calls for plenty of parking space, wich is why we have seventy parking spots. You can park your vehicle free of charge when spending at least € 22,50 in our restaurant. Please display your restaurant receipts behind your windscreen, so that we can check that you have indeed used the restaurant. We are autorised to call a tow company to remove your vehicle at your expense if these instructions are not followed, because it is prive property. The maximum parking period is 11 hours. Our truck park, which is accessible 24/7, has partial camera supervision. Truckstop 8 is certified according to the European LABEL, which concerns the safety and service at truck stops. Read our parking instructions in the languages: Dutch, English, German, Spanish, French, Italian, Turkisch, Tjech, Polish, Portuguese, Hungarian, Lithuanian, Bulgaria, Romanian and Slovak.